An Eco-Friendly Alternative to Acoustic Foam Panels! Audimute is recognized in the acoustics industry as a leader in “green” acoustics. With many products featuring natural and recycled technologies, Audimute has developed highly effective eco-friendly alternatives to acoustic foam panels. In fact, eco-C-tex® the sound absorption material we pioneered in acoustic panels uses only 1/10 of the energy required to produce fiberglass and 1/40 of the energy used to create acoustic foam panels. Almost every component in an Audimute acoustic panels is made of recycled material, and can be recycled again! Our fabrics are made of recycled materials. Our eco-C-tex (an Audimute innovation in green sound absorption) is made of recycled cotton and cellulose. 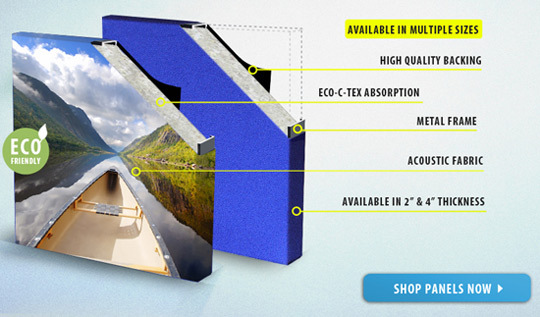 eco-C-tex is a health-safe, recycled acoustics absorption material and a better alternative to traditional fiberglass and synthetic acoustic foam panels. By converting recycled paper into cellulose fibers, paper is kept out of landfills where it has the potential to pollute the environment. Our lightweight steel frames are 100% recyclable. Incorporating natural and recycled materials into almost every component of its products, Audimute hopes to solidify its position as the leader in environmentally conscious innovation. "Our commitment to environmental responsibility will continue to be strengthened as we find new avenues to promote green acoustic solutions for our clients," says Audimute founder Mitch Zlotnik.